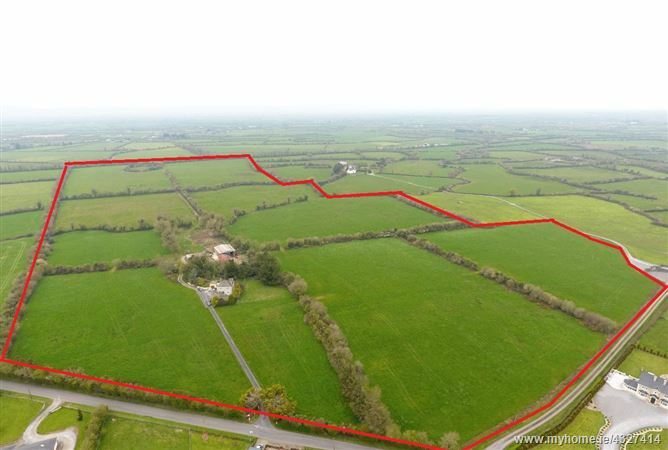 A truly superb roadside holding extending to circa 75 acres of land laid out in easily managed divisions, well watered and fenced. This high quality farm contains a modern two storey residence and a extensive range of farm buildings. Ideal for beef, dairying or equestrian uses. The land is laid out in nine well proportioned divisions and inspection is very highly recommended. Details on request call Tom Crosse on 087-2547717 or John O Connell on 087-6470746. Sitting room 12.6 X 13.0 :- Fireplace. Dining room 13.0 X 11.0 :- Fireplace. Built in display. Kitchen 12.6 X 11.0 / Dining room 12.1 X 10.0 :- Generous floor and eye level presses. Bedroom 1 12.6 X 9.0 :- Twin room with built in wardrobes. Bedroom 2 8.6 X 7.6 :- Single room with built in wardrobes. Bedroom 3 11.0 X 8.6 :- Twin room with built in wardrobes. Bedroom 4 13.0 X 12.6 :- Twin Room with built in wardrobes. 2. Good quality fattening lands. 3. 3 Column hay barn. 2 cubicle houses and yard. Former 6 unit milking parlour and diary. 5. Garage and fuel shed. 8. In close proximity to Kilmeedy, Dromcollogher and Broadford. 9. Electric storage heating in the residence. 10. Oil fired Stanley cooker (heats water). 11. Frontage to two roads. Broadford 5 kilometers. Kilmeedy 4 kilometers. Newcastle West 10 kilometers. Dromcollogher 5 kilometers.